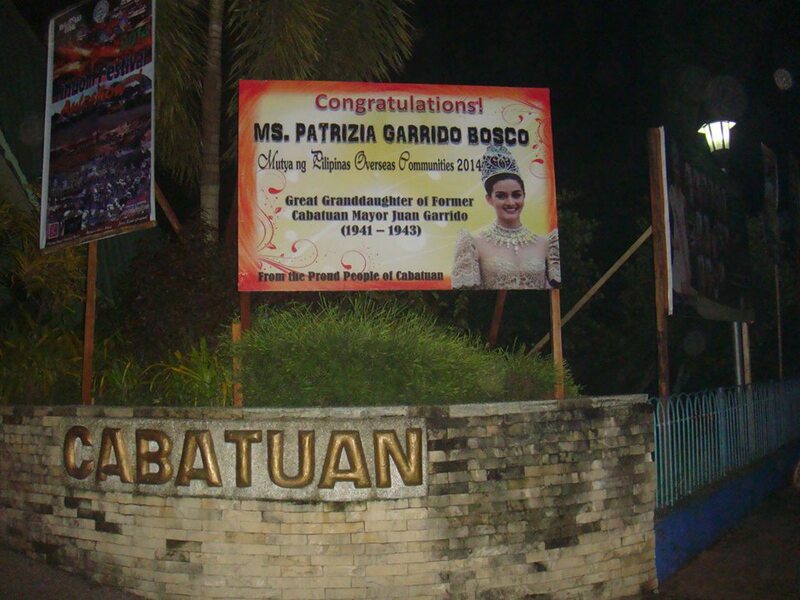 Cabatuan, Iloilo (September 7, 2014) - Patrizia Garrido Bosco, Mutya ng Pilipinas Overseas Communities, will crown Miss Cabatuan 2014 on Wednesday, September 10, 2014 at 7:00 P.M., at the Cabatuan Cultural & Sports Center, together with Miss Cabatuan 2013, during the town's Patronal Fiesta. She arrived today, Sunday, September 7, 2014, at the Cabatuan Airport. Tomorrow morning, September 8, She will be the Guest of Honor during the blessing and inauguration of various municipal projects, and will join Cabatuan mayor Ronilo Ontanillas Caspe in the ceremonies. Her great grandfather is Juan Garrido, the wartime WW2 resistance mayor of Cabatuan under fellow Cabatuananon, Tomas Confesor, the Governor of Panay & Romblon. By virtue of his being the Cabatuan Mayor, Juan Garrido and his family were captured by the Japanese on December 28, 1943 in Barrio Pamuringao, Cabatuan, and massacred on January 4, 1944 in Barrio Nanga, Guimbal, Iloilo. Barrio Pamuringao was later renamed Barrio Pamuringao-Garrido in his honor. Patrizia's parents are Chona Garrido, the daughter of Ernesto & Cecilia; and the late Gaudenzio Bosco of Milan, Italy. Patrizia can speak the local dialect of Cabatuan and Alimodian, which is Ilonggo/Kinaray-a. She was only 3 years old when her dad Gaudenzio passed away from cancer. She grew up under the loving care of her stepdad, Stefano Rijoff, who was the mayor of Muggio, near Milan, during that period. 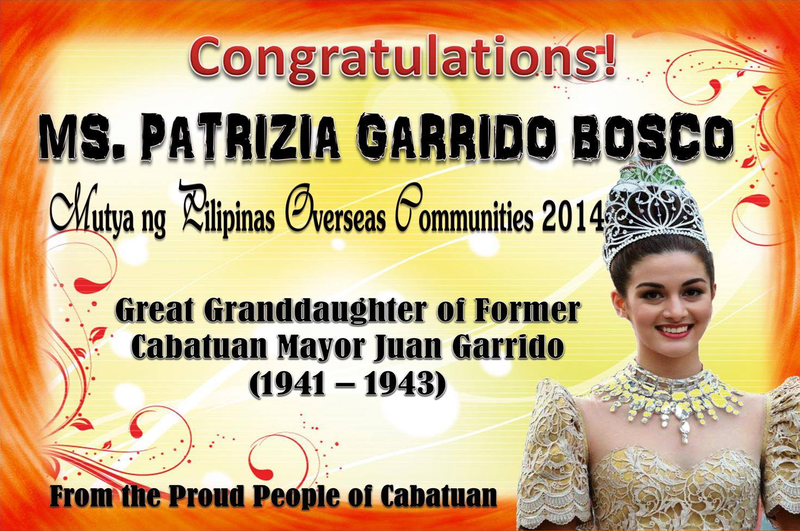 Miss Cabatuan 2014 will be Rica Paula Apistar Carreon, escorted by Leo Albert Grinn Sala. 1st Princess will be Reanne Kate Estante Moneva, escorted by Wayne Mark Enriquez Bade; and 2nd Princess, Nicole Beaniza Asis, escorted by Christian Earl Montalban Tabares. Miss Cabatuan 2013 is Dane Darien Tiongson Nufable. The Garridos of Cabatuan, as well as Alimodian and other towns, trace their lineage to the sister of Fr. Manuel Gutierrez, the Spanish Parish Priest of Cabatuan in the 1890's who brought his family to Iloilo when he was assigned here. The descendants of the Garrido family now reside primarily in Cabatuan, Alimodian, Leon and Molo. Born in Italy, Patrizia studied Commercial Journalism with different languages like German, English, Spanish and Japanese. She loves to travel and had been almost around the world. She is particularly interested in her Filipino roots and, in addition to the languages mentioned, she can speak Ilonggo (Kinaray-a).